Dawes County Journal: It's World series time..... let's talks Baseball! First, a disclaimer. These cheery guys aren't from Dawes County. 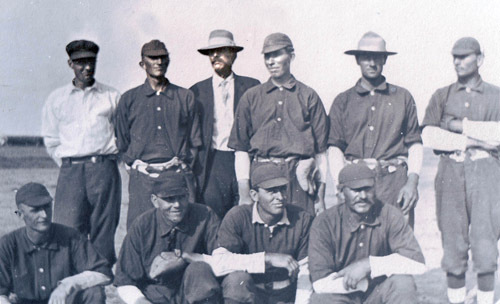 Well, some of them may have lived in Dawes County around the turn of the 20th century, but these fellows played baseball for the team from Beaver Valley east of Chadron. Yep, in Sheridan County. But the Chadron team just had to be a favorite opponent! We're told that this team routinely whopped the Chadron dudes. Suppose we could do some fact-checking on that, but we like the idea that they beat the city slickers. You'd think that Chadron would have consistently triumphed over these fellows. But I'll bet they didn't beat Whitney! If you're curious to know who this group of ballplayers from yesteryear were, check 'em out in our Baseball Gallery. A larger resolution photo and name key can be found there, along with a few other old baseball photos. Thanks to Lawrence Denton for sharing this bit of history.